Pihlaja View is a DPX image sequence viewer and EDL editor built into one small program. The DPX Viewer is a fast, timecode aware, image sequence viewer intented for viewing DPX-files, such as datascanned film footage or renders. Other formats are supported too. The optional Dual-view mode allows for visual split-screen comparison of two image sequences in sync. • Shows timecode (converted from the filename). Timecode-aware File Chooser. • Limited Quicktime export with burn in timecode (DV-PAL, DV-NTSC, Uncompressed 8-bit). Might be useful for offline editing. The exported files are not suitable (quality wise) for online work. • Image sequence copier/renamer. Copy a mark-in mark-out range of an image sequence (in any format) to some other folder. You can also perform a rename while copying. 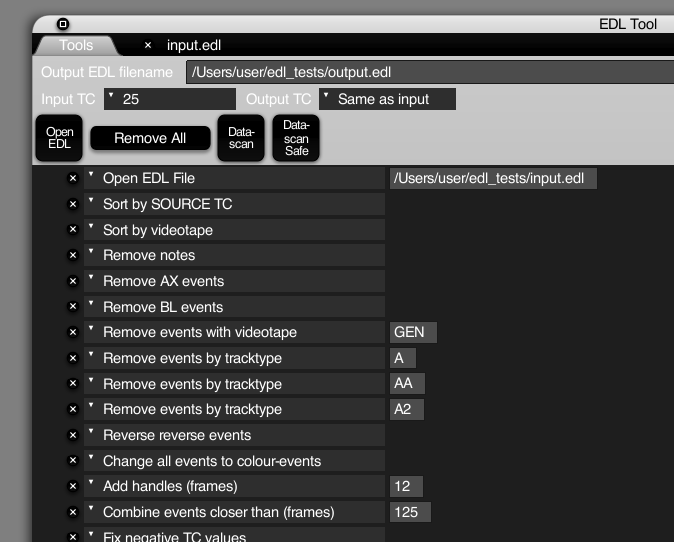 The EDL editor is quite barebones, but it gets the job done in most simple EDL-editing cases. It is not a text editor kind of editor for EDL-files, but more of a tool, where you choose a list of actions to be performed on a CMX3600 EDL-file, then the resulting EDL is written to disk. The intented use case is to prepare an EDL-file coming from the editor, so that it can be datascanned for example using a DaVinci 2k and Spirit 2k combination. The resulting EDLs are (usually) compatible with the DaVinci 2k, and usually result in just a few re-scans by hand. Other use cases are of course possible as well. • Supports framerates 24, 25, 30 drop-frame, 30, 48, 50, 60. Also converts framerates. E.g. 24 to 25 fps conversion.